There is something magical about baking pita bread at home. We do not do it because of the cost, even though homemade pita is cheaper than the store-bought variety. 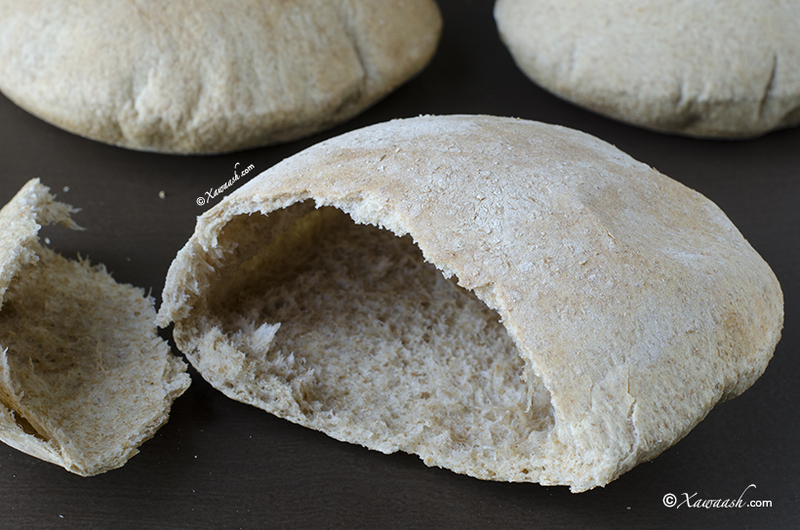 We like watching pitas puff up in the oven and we like letting the steam out of them and dipping them right away in homemade ful mudammas, hummus, or baba ghanoush. We also love having fresh pita with grilled meats: kebabs, kofta, or shish tawouk. 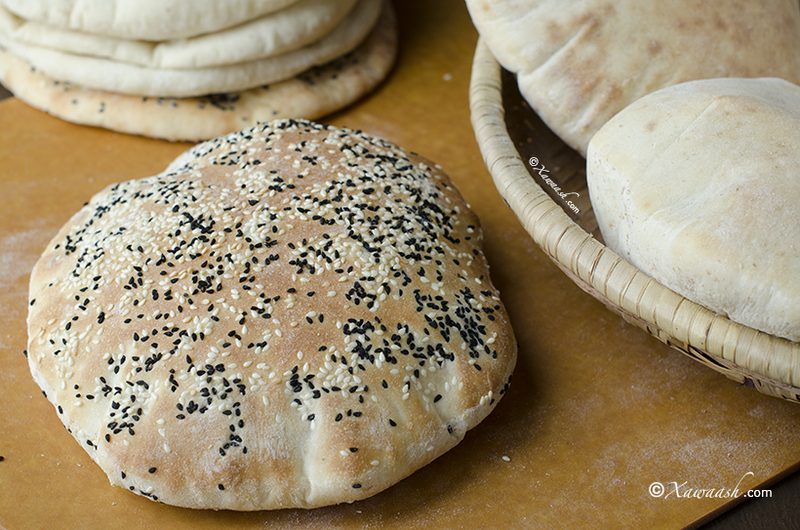 Whenever we go to a Middle Eastern restaurant that has freshly baked pitas, we look forward to the pitas just as much as the grilled offerings. Pitas are extremely easy to make and they have very few ingredients. You do not need a mixer or any other fancy kitchen gadget. 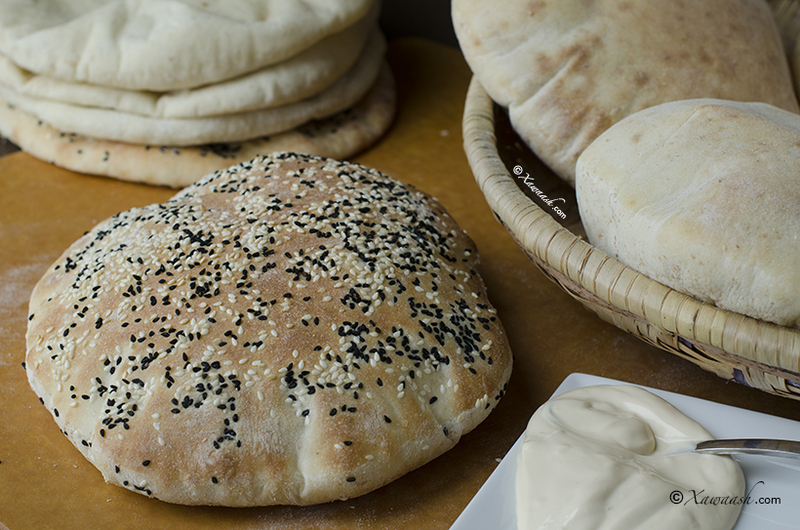 You can make whole wheat pita, white pita, or a combination. You can also add grains, omit the salt, replace the sugar with honey, and you will always end up with delicious, piping hot pitas. 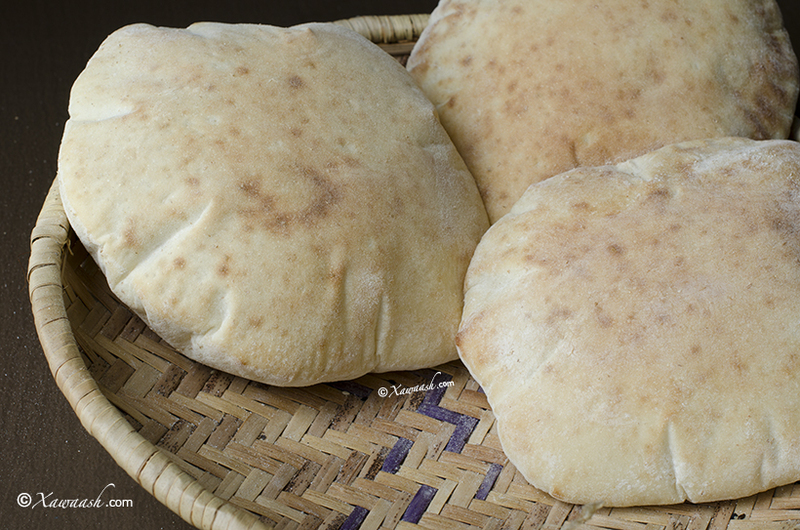 The pockets in the pita make them an ideal bread for sandwiches. Falafel sandwiches just are not the same with any other type of bread. 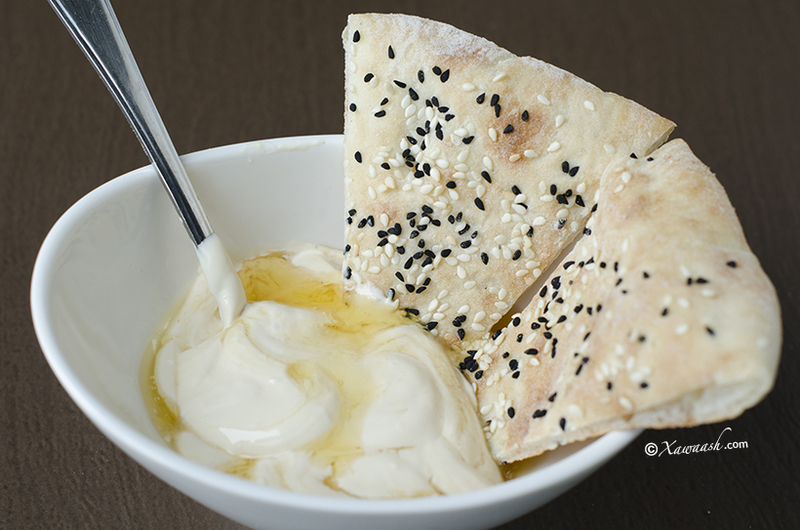 A favourite of ours is fresh pita with clotted cream and honey. Then there is the “tahini halva pita sandwich” and the “sweetened condensed milk pita sandwich.” Both may seem silly, but are delicious with a cup of tea with milk. The extra sweetness is balanced by a side of olives and cheese. Satisfaction guaranteed. Combine all the ingredients. 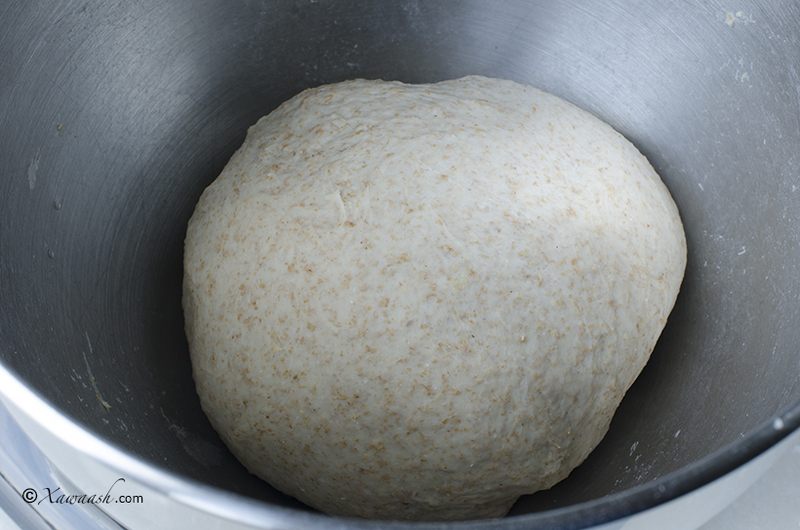 If using a mixer, knead for 5 minutes. 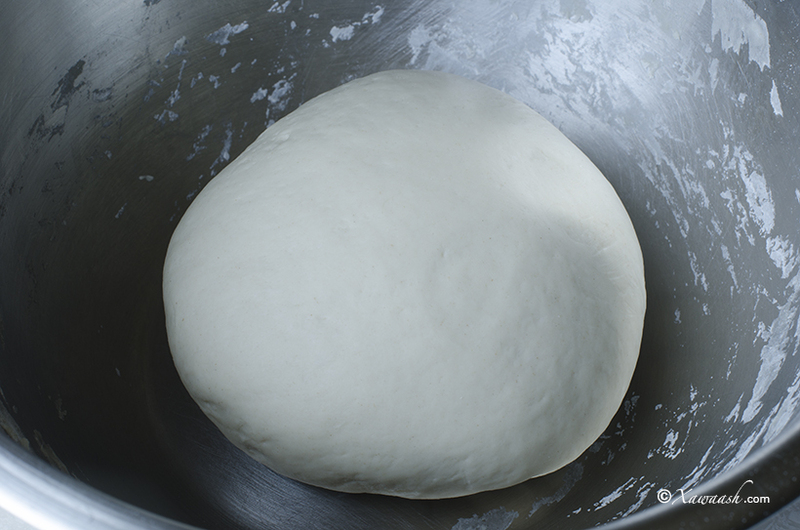 If mixing by hand, knead for 10 minutes. 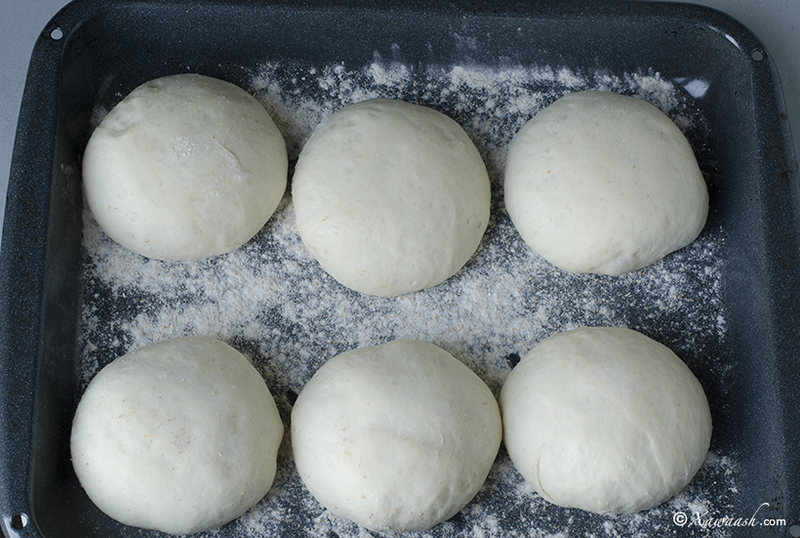 Devide the dough into six equal pieces and shape them into balls. Cover and let them rise again for half an hour. 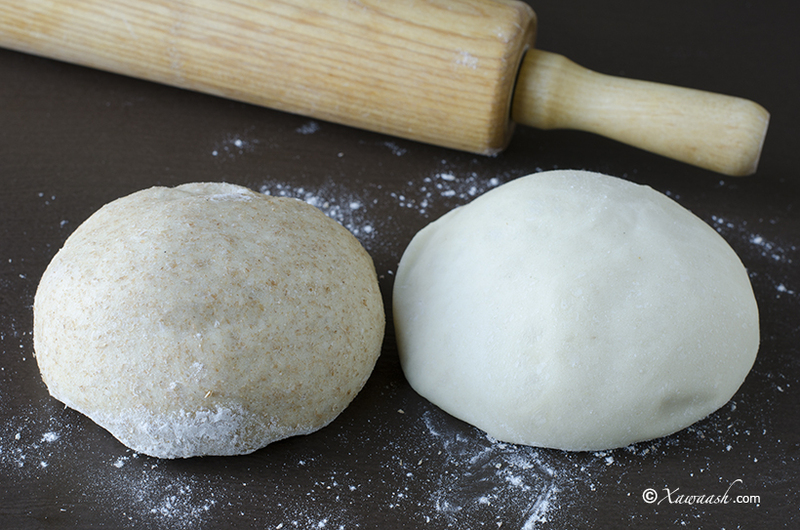 Roll out the dough to ¼ inch (½ cm) thickness. Let rest for 10 minutes before baking. 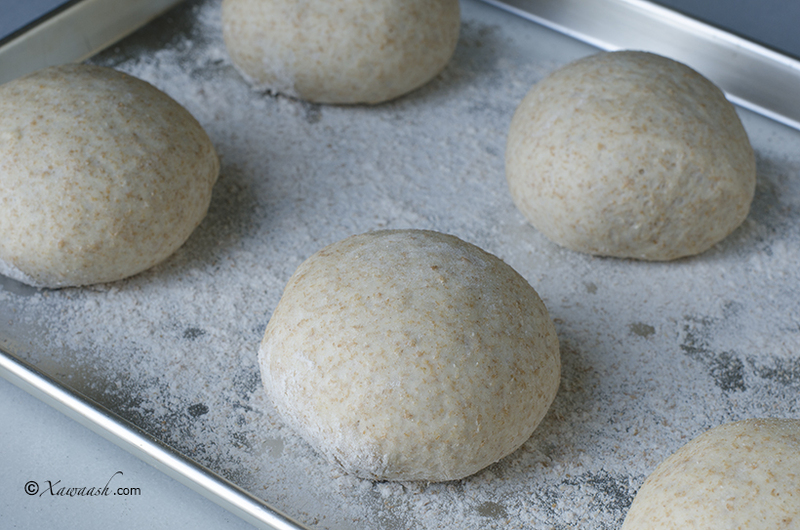 Bake in a preheated oven with a pizza stone or baking sheet at 500°F/260°C for 3 minutes. Mukawinaadka oo dhan baaquli ku rid. Haddaad makiinad isticmaaleysid, 5 daqiiqo ku rifaaq. Haddaad gacan ku qasaysid, 10 daqiiqo rifaaq. Dabool cajiinka oo ha fuuro muddo 1 saac. U qaybi lix gabal oo isle’eg. Dabool oo nus saac kale ha fuuro. Dhig muddo 10 daqiiqo intaadan dubin. Ku dub foorno la sii kululeeyey kuna jiro dhagax ama bir foorno 500°F/260°C muddo 3 daqiiqo. Il se passe quelque chose de magique quand on fait du pain pita à la maison. Nous ne le faisons pas uniquement à cause de son coût avantageux, même si une pita faite maison coûte moins cher que celle achetée au supermarché. Nous aimons regarder les pitas gonfler dans le four et nous aimons les presser pour faire sortir la vapeur et les tremper aussitôt dans du ful mudammas fait maison, de l’houmous, ou du baba ghanoush. Nous aimons aussi manger de la pita fraîche avec de la viande grillée: kebabs, kofta, ou shish tawouk. Quand nous allons dans un restaurant oriental qui sert des pitas fraîchement cuites, ellles nous mettent l’eau à la bouche autant que les plats de grillades. Les pitas sont extrêmement faciles à faire et contiennent très peu d’ingrédients. Pas besoin de mixer ou de gadget de cuisine. Vous pouvez faire des pitas à la farine complète, des pitas à la farine blanche, ou un mélange des deux. Vous pouvez aussi ajouter des graines, enlever le sel, remplacer le sucre par du miel, et vous obtiendrez quand même des délicieuses pitas toutes chaudes. 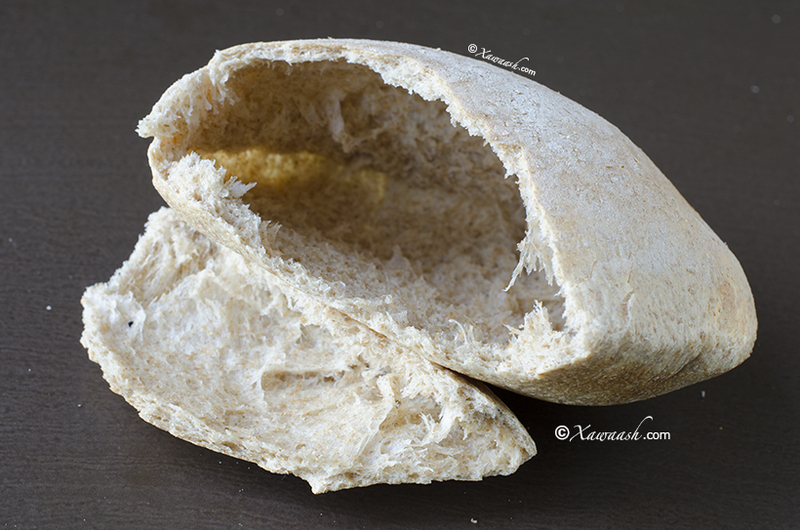 Les bulles dans la pita en fait un pain à sandwich idéal. Les sandwiches au falafel ne sont pas les mêmes avec un autre type de pain. Notre préférée est la pita à la crème fraîche et au miel. Il y a aussi le “sandwich pita au halva tahini” et le “sandwich pita au lait condensé sucré”. Ces deux sandwichs semblent bizarres mais ils sont délicieux avec une tasse de thé au lait. Le sucre est contrebalancé avec quelques olives et du fromage. Satisfaction garantie. Assembler tous les ingrédients. Si vous utilisez un mixer, pétrir pendant 5 minutes. Si vous pétrissez à la main, pétrir 10 minutes. Couvrir la pâte et laisser lever pendant 1 heure. Séparer la pâte en six morceaux égaux et former des boules. Couvrir et laisser lever une demie heure de plus. Étaler la pâte à ¼ de pouce (1/2 cm) d’épaisseur. Laisser reposer 10 minutes avant de cuire. Cuire 3 minutes sur une pierre à pizza ou une plaque dans un four préchauffé à 500°F/260°C. Waxaan rajaynaynaa inaad jeclaatid markaad samaysatid. Qayr ayaan kuu rajaynaynaa. Aad iyo aad ayaa u mahadsan tahay. We buy it from Halal stores or Middle Eastern stores. Aad iyo aad ayaa ugu mahadsan tahay faallada fiican. Foornada hoos keliya ayey ka shidnayd. Waxaa loo baahan yahay meesha ugu kulul inaad ku aaddisid. Dhagaxa biitsada ama birta foonada oo culus ayaa loo baahan yahay inaad ku dubtid. Masha,alah ,cunto sameyntiina wax laga dhergi karo ma aha ,sida wanaagsan aad u sameyneysaan,ilaah ha idin xafido ,waad mahadsantihiin.scw. Aamiin walaal. Adigana Ilaahay ha ku xafido qayr badanna ha ku siiyo. Aad iyo aad ayaa u mahadsan tahay. Walaasheenna qaaliga ah aad iyo aad iyo aad ayaa u mahadsan tahay. Waan ku faraxnay faalladaada. Qayr badan oo aan dhammaan ayaan Ilaahay kaaga baryaynaa. Aad baan idiin salamaaya walaalahayga qaaliga, wax badan ayaan ka faa’iiday page kiina aadna waad u mahdsantihiin,waxaan filayaa bulsho kale oo badan oo somaaliyeedna waydinka faa’iideysten ilaahay ha idinka jazaai siiyo. Waan ku faraxnay salaanta wacan iyo faallada waanna ku mahadsan tahay. Adigana qayr badan Ilaahay ha ku siiyo walaal. You are most welcome Ayaan. Thank you very much. salaan kadib, aad ayaa ugu mahadsantihiin rootiga macan aad na barteen. Su,aal aya idin weydiin lahaa ku saabsan Baking ammonia ama Kaadisooy. su,aasha xoogaa kuma saabsana cunto, lakin hadane dhan ayee ka saameenee. 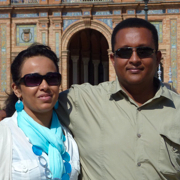 hadii aan bilaabo. waxa rabay inaa Cilaanka Sudanta isticmaasho marsado, cilaankaas oo aan loo qaseeninin sidii cilaanka somalida isticmaasho. ayaa hadane marki la marsado kadib hadii aad u baahantahy inuu Madow saa,id ah kuu noqdo, waxa la isticmaala Kaadisooy. oo Idinka xawaash.com hada ka hor u isticmaasheen Buskudka dhaadheer ee macaanka badan. Marka su,aasheeda waxay tahay ,cilaankane maloo isticmaali karaa kaadisooydaas. waxa carabi ahaan ku arkay magacaan ah نشادر nashadir. meelaha kaga helone wan jeclaan laha inaa ogaado, hadane kaadisoydaas talaajada ma la galiyaa, mise meel caadi wey taali kartaa???? jawabtiina aad ayee muhiim iigu tahay. Waa ku mahadsan tahay salaanta wacan iyo faallada. Soomaaliya waa loo isticmaali jiray cilaanka in lagu madoobeeyo. Markuu cilaanka qalalo inta la fujiyo kaddib ayaa la marin jiray, maro ayaa lagu duubi jiray, badanaa habeenkii inta la marsado ayaa lagu seexan jiray. Waxaad ka heli kartaa dukaamada Xalaalka, Farmashiyaha ama internet-ka. thank you for delicious food:) Please note that the recipe (Pita Bread) states to 2 tsp. in writing but the video states 2 TBSP. OLIVE OIL ? I just made this recipe with 2 tsp., we see how it will turn out! waa nii salamaay bahda xawaash. mmmm pita bread look yummi ad delicious. su aal: birta canjeerada ma dhax gelin kara fornada mise birta fornada. waa mahadsan tihin sida cuntada macaan noo bartiin. jazakala khery. Waa ku mahadsan tahay salaanta wacan. Labadaba waa isticmaali kartaa. Maasha Allah walaalehen, A&L aad baad umahad santihin sida hagar la’aanta ah ee aad nooga caawiseen dhanka cuntoyinka kala duwan. Run ahaantii pita bread aad ban ugahelnay, waana kumahadsan tihiin , illaah qary ha idiin kubadalo walaalayaal. Adigaa mahadda mudan walaal. Waan ku faraxnay inaad jeclaatay ceeshka. Qayr ayaan kuu rajaynaynaa. Mahadsanid. Amazing recipe – thank you! I made the whole wheat ones and they puffed up beautifully! The videos and pictures are super professional and the recipe is foolproof! I am trying your Ful Maddamas recipe next. What a lovely comment! Thank you vey much. Asalam calaykum waan iddin salaamay walaalayaal qayr Allah idiin siiyo I am a big fan of this website I tried this recipe exactly the same the dough raised beautifully but when I baked it didn’t puffed at all I don’t know what I did wrong so my question is do I need to preheat the baking sheet too will that make a different? JAZAAKA ALLAH QAYR. 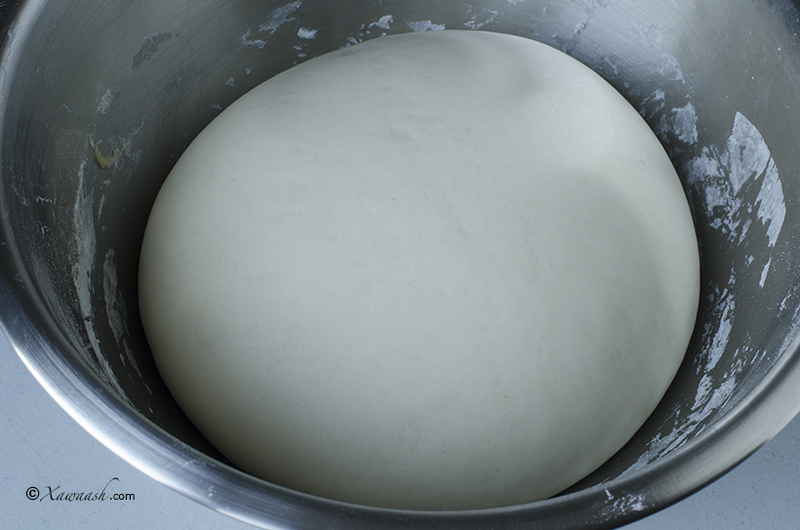 Did you let the dough rest after rolling it out? also, the baking sheet has to be preheated, and yes, it makes a big difference. We wish you success next time. Please can you tell me the name of your mixer which you made the dough? Thank you very much for your comment. We use KitchenAid. i just made this pita bread and it turned out really great! Thank You Again! p.s You are so beautiful in and out sister Laila and i love your kitchen ma shaa allah. Thank you so much our dear sister. Your comment is greatly appreciated. 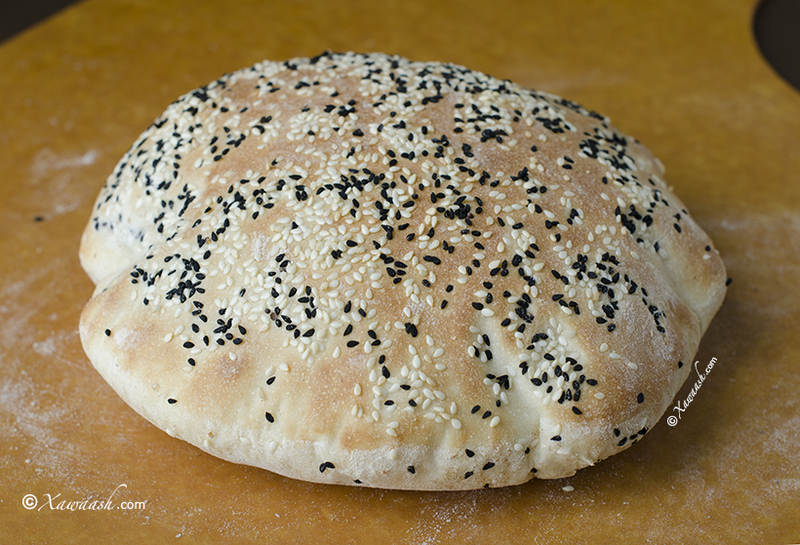 I can’t get good pita bread where I live and love it so want to learn to make it. I can’t get instant yeast I have dried active yeast which i have to reactive before use. Do you have suggestion how I use this yeast. It says 650g flour usually requires 15g yeast (dissolve in 150 water). You will need 2 1/2 Teaspoons dried active yeast. 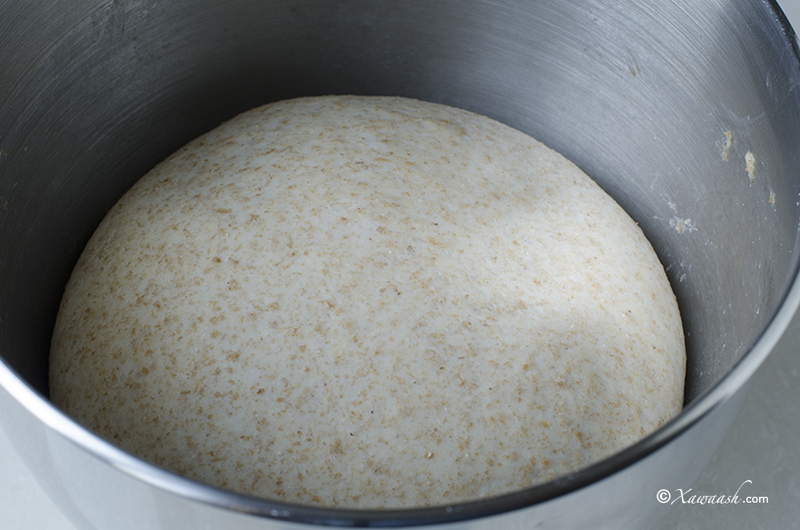 Activate the yeast for 10 minutes in half a cup of lukewarm water with 1 teaspoon of sugar. Remember to use half a cup less water when mixing. Tried making wholewheat pita today. I was all excited as the dough rose (I had to leave it for 2 hrs as I was going out). The six balls rose as well after half hour. I rolled them rested them for 10 min put them in the oven but they did not puff up. I used a baking tray. Not sure what went wrong. They taste nice enough, will be ok to use with dips. Did you preheat the oven and the baking tray? Just realised may be my oven was not hot enough. I guess that would have made the difference. Will have to try them again. The oven temperature is very crucial. You have made wonderful pita bread! I enjoy you demonstrating in the video. My question is can I prepare pita bread and freeze them for later use. Will it taste good? Thank you very much for your kind comment. Yes, you can freeze them and they will taste good. Waa ku mahadsan tahay salaanta wacan iyo ducada. Bir culus ayaa loo baahan yahay mana loo baahna in saliid la mariyo. ayada wan gadin karaa ? asw walaalayaal aad ayaad u mahadsantihiin wax badana waan ka faaiiday pagekiina, ilaahay haidinka abaal mariyo. waad mahadsantihiin. Adigaa mahadda mudan walaal. Qayr ayaan kuu rajaynaynaa. Mahadsanid.